Webinar: Connect with Borrowers on a Whole New Level! We have your mobile solution! Join us on Wednesday, February 18th, 10:00 AM PT for a FREE webinar. We'll show you how BorrowerMobile makes it easy for borrowers and lenders to interact, share information, and work together… with the touch of a finger! 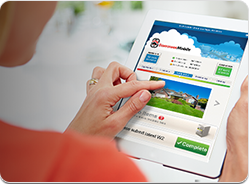 Designed for your borrower’s tablet or smart phone, BorrowerMobile is a direct communication and delivery channel between you and your borrowers. The application allows you to quickly and easily clear loan conditions from anywhere! Borrowers can monitor their loan status in real-time, eSign disclosures, reach out to loan contacts, and schedule events during the loan process. Watch a short two-minute demonstration.